I love pasta in what might be described as an inappropriate manner. There are some things that people never get sick of - for me, that's pasta. However, pasta has been getting a bum deal ever since that Atkins guy came along. Even if you can get past the effect on your glycemic index, THEN there's the carbon footprint. Most pasta is made from semolina flour which comes from durum wheat. In the US durum wheat is grown mostly in North Dakota and to a lesser extent in Arizona, California, Minnesota, Montana, and South Dakota. So unless you're in North Dakota, which most of us are not, that wheat has to travel a ways to get to the pasta production facilities, it has to be turned into pasta, then packaged, and then transported again to get to your grocer's shelf. Granted, the trip pasta has to make is not refrigerated, so it's not as bad as produce, but it's still a journey from which you can cut out a few unnecessary layovers on the way to your mouth. So what's a carb loving chick to do? About 6 months ago I think I must have been inspired by Michael Pollan's rule "Eat all the junk food you want as long as you cook it yourself." (Check out his new book Food Rules for this and more great, simple rules for eating better for yourself and the planet.) Well, that and I just read Heat and started openly dreaming about quitting my job and moving to Italy to learn how to make pasta by an old, Italian grandmother. Regardless of why I started doing this, the result was that I decided that to reduce the amount of pasta I eat, I would only eat it when I made it myself. Phew. No more pasta, right? Not so fast. I actually became quite proficient and can now make a basic wide pasta, similar to tagliatelle in about 45 minutes, total. Most of the prep time is the 30 minutes that the dough needs to rest before it is rolled out, cut, and cooked. That's just enough time to prepare a sauce, make a salad, or if you really want to earn those carbs, go for a quick jog. Here's my basic recipe that produces enough pasta for 2-4 servings, depending on your love of the noodle. Note: drizzles are approximately a teaspoon, but you're gonna have to eyeball it based on the relative humidity of where you live. Just realize that I've been making pasta in cold and dry New England in the winter. Put the flour in a medium bowl (I use Pyrex that has a top). Sprinkle salt on top and create a well. In the well, crack the egg, add one drizzle of olive oil, and the drizzle of water. Beat the egg with a fork and gradually incorporate the flour into the liquids. Once they're all incorporated and start forming a ball, turn out onto a floured cutting board. Knead for about 10 minutes sprinkling flour to the board if it's too sticky. 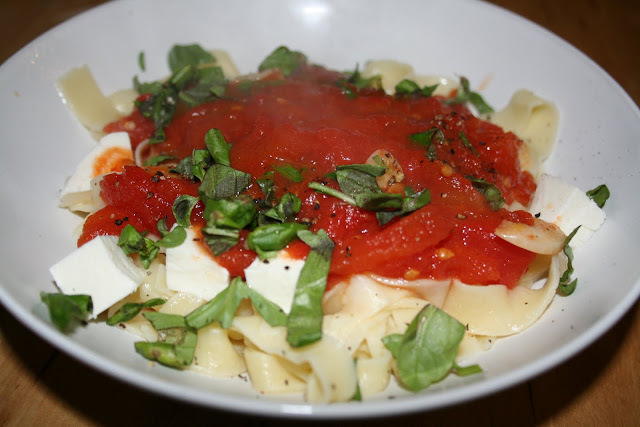 Sidebar: I felt completely inadequate the first time I tried to make pasta. Semolina flour is hard to work. Give yourself a break and start with regular flour. Every time you make it, start adding a little more semolina each time, until one day you can make it with full on semolina. Trust me, your arms will thank you for this. Form the dough into a ball. Then put another drizzle of olive oil on your hand and rub it on the surface of the ball. Place it in the bowl with a lid (as opposed to covering in plastic wrap) and wait 30 minutes (this is where the jog/preparing a salad/sipping a cocktail option comes in). Cut the dough in quarters, take one piece and recover the rest. Roll the dough out on a floured cutting board. If you're married and for some ungodly reason asked for a pasta machine in your registry, then go ahead and use that. 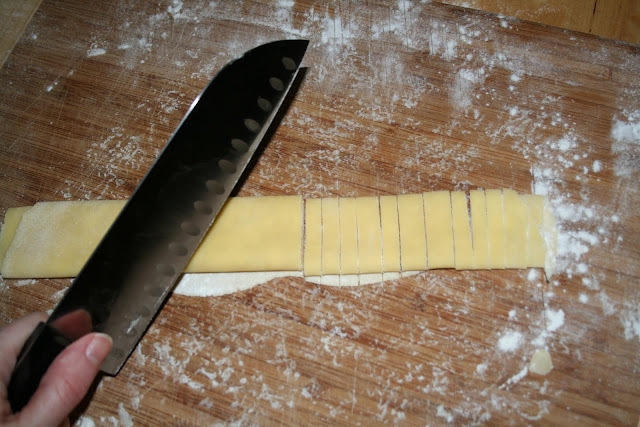 But if you're like me, single with a small kitchen, you don't have a lot of unitaskers like pasta machines and must roll out the pasta with a rolling pin. Don't worry, you can do it. Plus, as an added bonus, you'll end up with gorgeous sculpted arms without the embarrassment of using the Shake Weight. When the dough is thin enough that you can see the grain of the cutting board, it's ready. Sprinkle it liberally with flour and then basically roll it up, starting by folding it over one inch, and keep folding till it's one long roll. Once it's all rolled up, you can then cut it to the desired width. If you're a perfectionist, you can make them really thin and all the same size. If you're hungry, you'll just make sure that you don't slice your finger while you're at it. When they're all cut, toss them around with a little more flour to separate them. 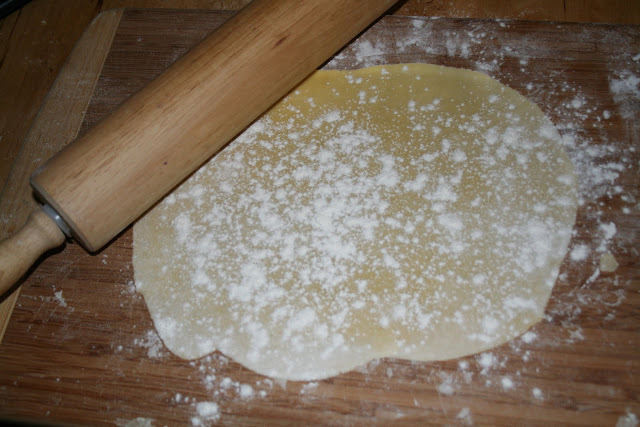 Repeat the rolling, cutting, and tossing with the remaining three pieces of dough. When you're done, boil them for a few minutes and enjoy. Alternatively, you can hang them to dry and use at a later time (I've used clothes hangers for a drying rack). Remember, this will be relatively difficult the first few times you do it. But like anything else, it gets easier with repetition. Fortunately, it always tastes good, so practice makes perfect, and it also makes for a happy belly.